FRANKFURT (Bloomberg) -- Porsche Automobil Holding SE faces a suit from a group of investment funds seeking about 2 billion euros ($2.6 billion) in damages allegedly suffered from the automaker's failed takeover attempt of Volkswagen AG in 2008. The group, whose members weren't identified, filed the lawsuit in the district court of Stuttgart, Germany, according to a statement released on the OTS newswire late Friday. Reuters, quoting sources close to the funds, identified the plaintiffs as Elliott Associates, L.P., Elliott International, L.P., The Liverpool Limited Partnership, Perry Partners L.P., Perry Partners International, Inc., DE Shaw Valence International Inc., and York Capital Management Europe (UK) Advisors, LLP. They are represented in Germany by the Broich Law Office. The plaintiffs also filed an arbitration application regarding Volkswagen, two members of the VW supervisory board and one member of the management board of VW, according to the statement. "The accusations are not justified and we reject them," said Frank Gaube, a spokesman for Stuttgart-based Porsche. The company needs to receive the suit before it can closely examine it, he said. 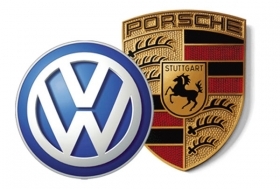 Porsche and VW agreed to combine in 2009 after Porsche racked up more than 10 billion euros of debt in an unsuccessful attempt to gain control of VW. The merger has been held up by lawsuits linked to Porsche's failed effort to buy VW, with the Wolfsburg, Germany-based carmaker waiting to avoid being held responsible for any financial ramifications from the suits. The investor group's complaint alleges that "Porsche gained control over the price of VW common stock as it secretly built enormous derivative positions covering almost all of VW's freely traded shares, then triggered a massive short squeeze, and finally released billions of euros worth of shares into the short squeeze for its own profit," according to the statement. Porsche has already been the subject of lawsuits in Germany and the United States -- which have so far failed -- alleging it quietly bought up the shares as part of a plan to take over Volkswagen while saying publicly it had no plans to do so. VW spokesman Michael Brendel didn't immediately respond to a request for comment.